Car crashworthiness refers to how well a vehicle protects its occupants in the event of an auto accident. Vehicle crashworthiness involves the "second collision" in a vehicle accident- the collision in which the occupants of the vehicle collide with the interior of the vehicle, which can result in injury to the occupants. 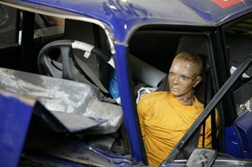 Safety features that comprise car crashworthiness include airbags, seat belts, headrests, roll bars and crumple zones. Any feature that is designed to minimize an occupant's injury - including preventing the occupant from being ejected from the vehicle - is included in vehicle crashworthiness. Send your Car Crashworthiness claim to a lawyer who will review your claim at NO COST or obligation. Vehicle manufacturers have a responsibility to design vehicles that are crashworthy. This means that when the vehicle is designed, the manufacturer must take into account the possibility that the vehicle will be involved in an accident. Failure on the part of the vehicle to adequately protect occupants could mean that the vehicle manufacturer is liable for any injury to the people in that vehicle at the time of the crash. Injuries that can result from a vehicle that is not adequately crashworthy include spinal injuries, brain injuries and internal injuries. According to the NHTSA there were 33,808 highway deaths in 2009 and that number decreased by 1,000 in 2010. Although 2010 was the safest driving year on record since 1949, car crashes remain the leading cause of death in people ages three to 39. Each year more than 43,000 Americans still die in auto accidents. The Insurance Institute for Highway Safety (IIHS) reports that from 1982 until 2005, US driver death rates per million passenger vehicles registered decreased 51 percent. The report noted that most of that drop came from frontal crashes, in which driver death rates decreased 53 percent, due to such factors as frontal airbags, higher seatbelt use and more crash-worthy vehicles. In contrast, driver death rates in side crashes decreased 42 percent during that time. The NHTSA has set standards that auto manufacturers must meet to receive a crashworthiness rating for different types of crashes. Vehicles are tested for their performance in frontal collisions, side-impact crashes and rear-impact crashes. Vehicles are then given a rating based on the chance of serious injury. One star = 46 percent or greater chance of serious injury. One star = 26 percent or greater chance of serious injury. The Insurance Institute for Highway Safety (IIHS) also measures car crashworthiness. The IIHS categories for car crashworthiness are based on the vehicle's performance in high-speed front and side crash tests, rollover tests and evaluations of seat/headrest restraints. Vehicles are then put into one of four categories: good, acceptable, marginal or poor. There are differences between the NCAP tests and the IIHS tests. In addition to frontal crash tests, the IIHS performs tests that involve what are called offset crashes. 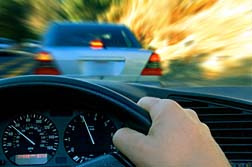 Offset crashes occur in frontal collisions, but only involve a portion of the front of the vehicle, such as when a vehicle strikes something with only the drivers' side front of the car. Offset crashes typically involve more intrusion into the occupant compartment of the vehicle than full, head-on collisions. Issues with car crashworthiness involve manufacturing defects, such as when an airbag fails to deploy; design defects, such as when a fuel tank is placed in a location that makes it likely to explode on impact; or failure to warn, which is when the manufacturer knows that there is something dangerous about the vehicle but does not warn consumers about that danger. Problems that may cause serious injuries or death include door latch failure, car seat problems, defective airbags, defective headrests, defective seatbelts, defective tires, faulty fuel tanks, passenger van rollovers, roof crush, side impacts, SUV rollovers and underride accidents. Door latches are vital to the safety of a vehicle. The latches should be designed to stay closed in automobile accidents to prevent the vehicle's occupants from being ejected from the vehicle. If the door latch fails, the door could open, allowing the occupant to be thrown from the vehicle and increasing the risk of serious injury. Causes of door latch failure include mechanical problems, improper design, improper construction and improper installation. Car seat backs should stay upright in an accident to prevent injury to the person sitting in the seat. However, some seat backs are known to have collapsed in an accident, either from the initial force of the accident or from the occupant's weight being thrown around during the collision, causing serious neck and spinal injuries to vehicle occupants. 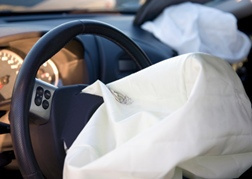 There are a variety of problems that can occur with defective airbags, including side airbags and curtain airbags . These problems include airbags that fail to deploy, airbags that deploy unnecessarily and airbags that deploy with so much force that they cause injury and even death. Problems with airbags may be caused by poor design, inadequate censors and other defects. Injuries caused by defective airbags include abrasions, lacerations, hearing problems, head and brain injuries, neck injuries, broken bones, chemical burns and, in severe cases, death. Headrests are designed to prevent vehicle occupants from suffering serious neck injuries in an accident. Those injuries can be caused when the person's body is thrown back into his seat during a collision. However, when headrests are improperly designed, vehicle occupants can suffer severe injury, including whiplash, concussion, skull fractures, spinal fractures and brain damage. Seatbelts are designed to protect vehicle occupants from serious injury; however, seatbelts that fail to perform as designed can cause devastating injuries. Seatbelt problems include mechanical defects, design defects and mechanical component failures. Injuries associated with defective seatbelts include strangulation, broken bones, head trauma and death. A vehicle's tires should be safe and sturdy—they should be designed and manufactured to properly handle a vehicle load and the speed the vehicle is driven at. However, there have been problems with defective tires that can lead to fatal accidents and serious injuries. These problems include tires that crack or split, blow out or experience tread separation. 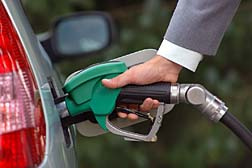 Defective fuel tanks can cause devastating injury to vehicle occupants. A main issue is that improperly designed fuel tanks can cause fires if the vehicle they are a component of is involved in an accident. Such fires are dangerous and can cause explosions, risking the lives of anyone who is trapped inside a vehicle. Issues with fuel tanks include punctures, tearing, fuel line separation, and filter cap separation. Passenger van rollover accidents can be devastating. Some passenger vans are unstable because they have a high center of gravity and a narrow wheelbase. This makes some vans more prone to rollover accidents. 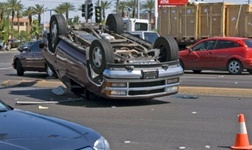 When vehicles are involved in rollover accidents, occupants rely on the roof or roll bar to protect them. However, some vehicles experience roof crush, which is when the roof of the vehicle does not maintain its structural integrity in a rollover accident. Injuries caused by roof crush can be traumatic, including neck and spinal injuries, paralysis and even death. The frame of a vehicle is more thin on the sides than at the front or back, which makes side impact collisions dangerous for occupants of the vehicles. Features that can protect vehicle occupants in a side collision are strong doors and side airbags. SUV rollovers are incredibly dangerous to vehicle occupants. Unfortunately, because they have a high center of gravity and narrow wheelbases, combined with being top heavy, SUVs are prone to rollover accidents, especially when the driver attempts to perform an evasive maneuver—such as swerving—at a high speed. Other circumstances that can lead to SUV rollovers include tire failures, inadequate brakes and poor stability design. Underride accidents occur when vehicles with uneven bumper heights collide and one vehicle's rear bumper forces the bumper of another vehicle to go beneath it. These can be the result of accidents between SUVs or vans and cars, mainly because there are no bumper requirements for SUVs or vans—car bumpers must all be within a few inches—or accidents involving tractor-trailers. Under crashworthiness law or doctrine the auto maker is liable, in negligence and/or strict liability, for the enhanced injuries sustained from the secondary collision in an accident, meaning the passenger's impact inside the car. A crashworthiness attorney can sometimes claim damages in a defective vehicle litigation or crashworthiness lawsuit. In a crashworthiness lawsuit, the accident itself is often irrelevant. Rather, car crashworthiness law looks at whether the manufacturer designed the vehicle and its components so that it is safe for any reasonably foreseeable use, and the use includes the possibility of its involvement in a collision. Congress and some state legislatures have made strides in establishing that a vehicle manufacturer's compliance with government safety standards is a valid defense to a vehicle defect claim. However, courts still rule that, regardless of federal standards, manufacturers have a duty to build a vehicle that is as safe as is reasonably possible under the present state of mechanical technology, vehicle design, and safety. An attorney experienced in crashworthiness law can help with your legal options and can call on experts on car crashworthiness design and defects. If you or a loved one has suffered from an auto accident in which the vehicle was not "crashworthy", please click the link below to send your complaint to a lawyer to evaluate your claim at no cost or obligation. New Generation of "Advanced" Airbags—Better or Worse? Car Crashworthiness Integral To Redesigned Po..
What About the Crashworthiness of Subway Cars? SUVs Susceptible to Rollovers, Regulations fo.. Car Crashworthiness: Are Newer Vehicles Desig.. I was involved in an accident in 2012. The big bus I was traveling in was involved in a head on collision with a fuel tanker truck. I am not very sure of what happened because I had fallen asleep during the journey and was only awoken by the commotion that was taking place in the bus. The greatest mystery that I want to come out is the way I came out unscathed in that accident. What happened was that I had my crown of my head propped against the seat in front of me as I slept. Awakening from my sleep I found that the seat I had my head on had uprooted itself from its position and was twisted pressing the passenger sitting on it to the opposite seat and unable to free her self out. I believe that when an accident happens we tend to move at the motion the vehicle was in when it suddenly stops. So can someone explain to me what would have happened for the seat to move while my head was on it and i came out without even a head ache. I was driving down a backroad in Greensboro, North Carolina when the car in front of me suddenly stopped. I was going 55mph and did not have sufficient time to brake and I crashed into said car. My air bag failed to deploy. The front was completely damaged and my car was almost totaled. My neck was swollen prior to and I had back aches for days after. Head, neck, back, and shoulder injuries. Nightmares. Anxiety. Physical damage to car was minimal. However I have had continued symptoms due to post concussion syndrome. This was just diagnosed on Sept 13. I'm now written out of work for the 3rd time. I was driving my car during work related activity and filed for workman's comp. They turned down my claim prior to my post concussion diagnosis. I'm in financial straits and may lose my job because my family leave time has expired and Workers Comp has not acknowledged responsibility. I need help with an appeal and I need help pursuing pain and suffering from the party who rear ended me. Broken left shoulder blade, "traumatized" muscles of the body (especially on the left arm), bruised lungs, internal bruising of the lower back and left hip, stitches required on the forehead and top of scalp (cut stopped a layer before where the brain is), bruised neck and back, stitches on left arm, internal bleeding in the spleen, cuts and bruises on the body. My passanger airbag went off with no one in it, but my drivers side didn't. My internals are hurting very bad, bad whiplash, bruised ribs, neck, etc. I hit the van squarely with my front, squarely on his back. My husband was in an accident where he hit a culvert, took out two road signs, flipped end over end 2 1/2 times and then hit a telephone pole. We have at least 6-8 airbags in our 2005 Jetta and not one deployed, the car was a total loss. My chest was crushed, my sternum fractured. both knees were bruised from hitting the dashboard, My left foot was trapped by the door caving in on the floor that moved 10' into the driving compartment. I had scalp lacrerations and a concussion from hitting the window of the driver door. I don't know how my hand became swollen & bruised. Other bruises on legs, arms and trunk. Severe headaches. I have pictures taken by a witness before the rescuers reached my car to use "jaws of life" to get me out. I broke my back in 3 spots, broke my chest plate, broke all of my ribs on both sides, (except the top 2 right ribs), broke both of my shoulders, and other life threatening injuries. It has been a little over 9 months now and I still can't work, and don't know when I will be able to work again. I have photos of the accident that were taken at the scene by the state highway patrol. While sitting stopped at light behind another car, with brakes applied, was struck from rear by another auto. Both rear and front bumpers need to be replaced. The impact was sufficient to leave imprint of Honda Emblem from auto behind, and force my auto forward driving the other auto's trailer hitch through my front bumper. Also, the force was sufficient to cause the dash trim to pop off the instrument panel. I do not have a problem with the driver who struck me from behind. Accidents happen and her insurance company will repair the damage. My concern is the fact that the air bags did not deploy. What if I am forced off the road or hit head on at 70 MPH, can I feel confident that I am Safe? Luckily, no one was physically hurt although the front rider, our daughter, hit the dash board. Impact was at about 30 miles per hour, and our vehicle rear ended a pick-up truck. Accident report was made. We called Hyundai dealership, then consumer affairs because the airbags & seatbelt didn't work property. They sent us a laundry list (11 categories) of information they wanted one week later. My son died a few weeks after he had a wreck in an Eddie Bayer explorer because of a defective sway bar. He had been on life support for a former wreck only months before and we know he was not internally bleeding after the first wreck from all the test the hospital took of him. My life can't ever be the same. My son died and I mentally died with him.